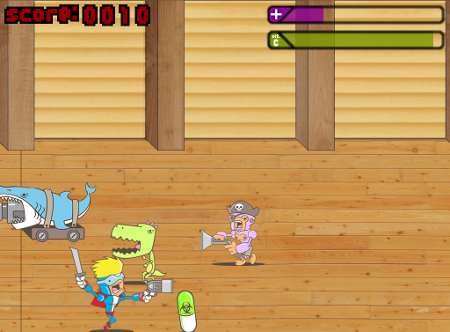 An epic tale of super heroes, scurvy, zombie-pirate monkeys, dinosaurs and laser sharks. 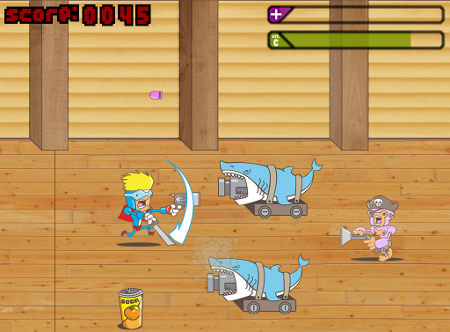 The game places the player in the boots of our protagonist "Captain Awesome". Unfortunately, the poor captain is attacked by his nemesis "Moustachio", an evil zombie-pirate monkey. This leaves the captain trapped in his own cargo hold with only his sword and pistol to fight his way out. The player must fight zombie-pirate monkeys, dinosaurs and laser sharks in ever more difficult waves to try escape, all the while collecting orange soda in order to fight off the effects of scurvy. I developed this game along with three others as part of the Sham Jam in September 2011. The Sham Jam is a 48 hour, national games jam hosted by Open Emotion Studios to promote games development in Ireland. The games created this year were submitted to the Winnitron network. This will allow players around the world to enjoy these games for free on Winnitron arcade cabinets. The game is coded in C# using XNA 4.0. As the game was created in only 48 hours the entire team was quite happy with the outcome. Programming: Myself, Colin Deasy and Darragh Jennings. 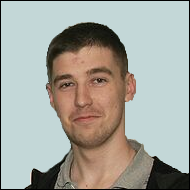 Music and Sound Effects: Darragh Jennings. Thanks to all at Open Emotion Studios for being great hosts.